The major online Chinese reseller OppoMart is now offering the Meizu MX4 Pro on its website. The best news is that the vendor traditionally supports shipping to practically anywhere in the world so now you can get your hands on the flagship device and have it conveniently delivered to your doorstep. The device is currently available in two variants - a 16GB version, going for $549 and a 32GB, priced at $599. Sadly only the gray handset is currently available, but hopefully the vendor will acquire stock from the white and gold variants as well. The Meizu MX4 Pro is a true flagship offer by the Chinese manufacturer that builds upon the immensely successful Meizu MX4 and is causing an equal if not bigger stir on the local market. The Android device is powered by an octa-core Samsung Exynos 5430 SoC, has 3GB of RAM and boasts a 5.5 inch 1536 x 2560 pixel IPS display. It is also adorned by a 20.7MP camera along with an impressive array of other technologies, including Cat4 LTE, Wi-Fi ac and GPS with GLONASS. 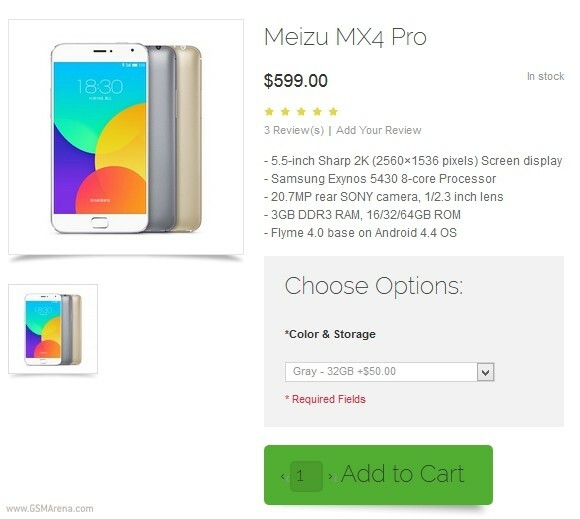 So if you are in the market for a Meizu MX4 Pro there can't be a better time to order one, but be sure to act quickly as supplies may not last very long. Its Awesome. give a try dude, it s fantastic! MX4 Pro my world!